I cannot figure out where 2019 is going. Joining Coco and Deborah to see if we can figure it out over coffee. C is for Cookie.. and Cari! Cari likes cookies! If we were having coffee I’d tell you I’ve had way too much lately. Between the cold (almost 100% better, but you know how they linger), early PT and general busy-ness, I’ve reverted to my need for afternoon coffee. Luckily I’m still tired enough that it doesn’t affect my sleep, but I need to get back out of this cycle. Or at least drop back to office coffee so I quit keeping Starbucks in business. I’ll never give up my iced Dunkin’ in the morning. Starbucks’ white peppermint mocha is amazing crack though. I’m still trying to follow my advice to myself last summer. I am a much better human when I don’t live on caffeine and sugar. 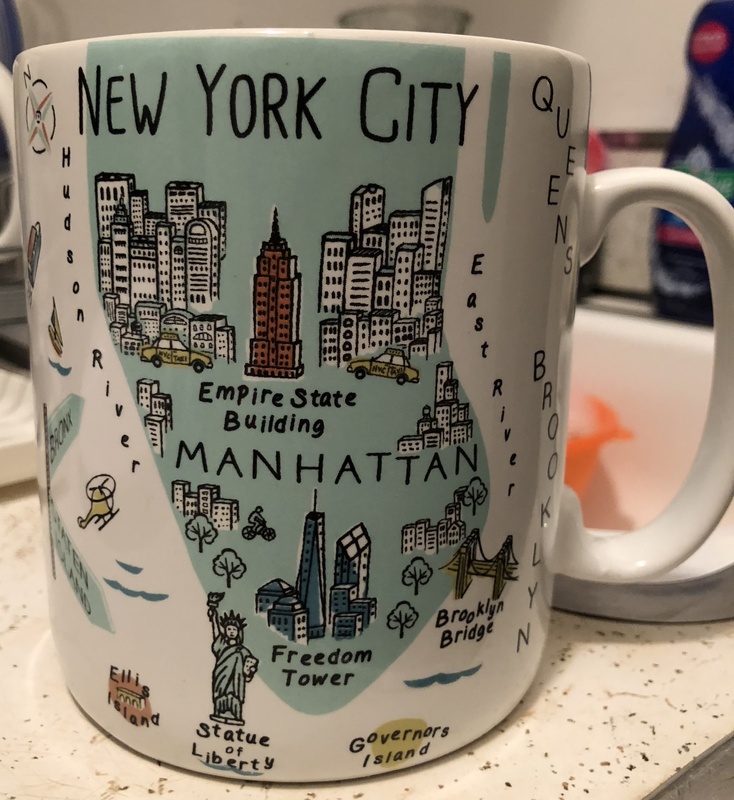 This mug was a random find years ago at Christmas Tree or Bed & Bath and has nothing to do with running, but with the NYC Marathon drawing and NYC Half on the horizon it has taken on some fun meaning. Although it’s eight months away, the NYC Marathon is beginning to feel real thanks to the social media buzz around the drawing on Wednesday. I’m almost positive I’m not going to make running it “Facebook official” until the day of. Ideally with a medal around my neck. When I ran Lebow last year I didn’t even tell my best friend, mom and brother until morning of when I sent them the tracker. I won’t do that for this, in fact my brother knows. I haven’t decided how I’m telling mom & Bob yet. Only one colleague knows and he knows I don’t want to talk about it. I generally don’t like being the center of attention and specifically not about running. I am planning to fundraise for an organization I have for some time, but as I don’t need to raise a huge amount it’s easier to keep quiet. 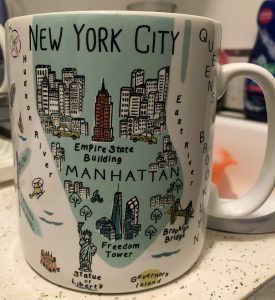 run the NYC Half (more on that below) to get an idea of current fitness and how much base building I want to do ahead of training’s start in late June. get my legs into a place of three or four run days a week. I think Tuesday, Thursday, weekend long run is likely. If it’s a Saturday long run, Monday, Tuesday, Thursday, Saturday might be the best way to get to four days. make the race-day decisions like bus or ferry. I’m going to need a lot of coffee on March 15. When I upgraded my NYRR membership last week it opened up a volunteer slot for the NYC Half expo so I’m working that on Friday afternoon. Not sure exactly in what role, but I’m sure like last year’s medal shift it will be good for steps. Then more coffee on March 17 after the Half. Although I’m Wave V (yay, Turtle! ), weekend morning subways and a start in the middle of Prospect Park are going to mean an early start. I have no time goal for the NYC Half and didn’t even before the Achilles derailed the first two this year. I just want to have fun. Running over the Manhattan Bridge, up the FDR and through Times Square into Central Park is something I want to enjoy every second of. I’m starting to plot out the balance of this summer’s race calendar and other than a new one to the NYRR calendar, I think they’re all going to be repeats. That’s a weird feeling to me as I still feel like a running newbie. See you next month. Maybe. Friends in town that week so blogging iffy. I love this linkup when I can get to write it. 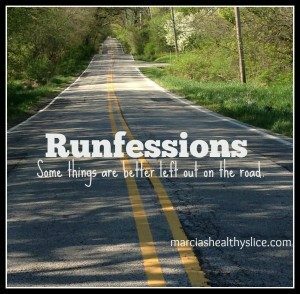 Outside of your blog, because I feel like there are few secrets here, do you tell friends and family about major races? Starbucks – too much. At work, I started using k-cups to save $$. Still I have enough stars for a free something next week. 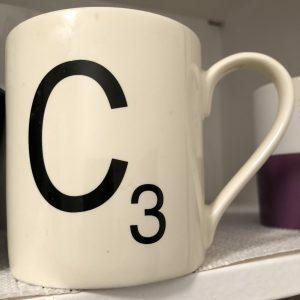 That is a great mug!!!!!! No goals at all for NYC even before the injury. Now I just hope I didn’t make the wrong decision and my calf gets worse. Goal races??? I thought it would be my April 13 local race… but not running now, I feel like I have lost my speed and endurance. I just want to run for fun now and be pain-free. I prefer Dunkin’ iced and Starbucks hot. It’s weird how they differ. I’m not sure if it’s sold out yet, but there’s a Strava/NYRR virtual Half that you can do for guaranteed entry to the 2020 NYC Half. I was bummed but not surprised we couldn’t double dip and get guaranteed entry for next year. I don’t drink coffee, but obviously I’m a big fan of mugs & that’s a great one! Love it! I have zero goal races on my calendar now. In fact, i have zero races at all on my calendar right now. Such is life sometimes. Most of my friends are actually runners, because I didn’t know anyone when I moved here. Some are very serious runners, some not so much, but almost all of them run in some way. My parents always ask about my races, so I tell them, and my siblings usually express some interest, too. My brother has run some, but it’s not really his thing, and my sister tried it without any running shoes or knowledge, injured herself, and quickly called it quits. My brother and SIL have both run marathons. I was lucky they didn’t run a Half so mom could post that she was waiting for her favorite Half Marathoner at Ft. Lauderdale finish.We have a good work group of runners, hence the office run group but most of my non-work friends aren’t runners. Many are active in some way or another – kind of fun to talk about our different interests. I’m not really into cute saying mugs — not that I don’t like them, there’s the whole space thing which is bad enough with my collection — but my collection does have great sentimental value to me & I do use them. I always tell friends and family about races. In fact, they probably wish I would shut up! I don’t do well with keeping my mouth shut! 🙂 Good luck with NYC. I hope you got in. Thank you! I am in, had guaranteed entry via 9+1 so that took the edge off. Personally, I couldn’t function without my morning cuppa. But no sugar for me. I do love Starbucks, but I don’t do the heavy drinks. Just a little frothed milk on top and I’m good to go. The excitement around NYCM is something else. I don’t know anyone who got in via lottery. I’m much more of a Dunkin girl – love their iced coffee once the weather warms up! The NYC Half looks like such a great race! I would love to through my hat in for next year’s lottery. I kinda go back and forth on letting people know about my races – my family’s really supportive of my running, but I have a number of friends who are not runners so I don’t discuss my running a lot around them. Yep! I literally had that conversation with a dear friend. Running is another language at times. I always try to cut down on coffee and it does work occasionally simply because the coffee at work is AWFUL. I used to work at Starbucks (the roasting plant in Amsterdam) and it’s just in my blood now. 5 years with an awful alternative helps cut back. Also? we have 1 SBUX in town and one “on the go” machine at a Shell gas station and both are inconvenient to get to so it’s usually only on the weekend. Sometimes though, I just feel like having an espresso in the afternoon. There are worse addictions I suppose. I am pretty open on my blog about everything but that doesn’t mean I say everything out loud in person. I did keep Amsterdam marathon a secret last October because I had just DNF’d the Warsaw marathon. I wanted revenge in my own way, but also? I wanted to be able to decide NOT to run it if I wasn’t feeling it. I think the only thing I don’t talk about much, simply to protect the innocent 😀 , is the challenges of being married to someone who has and ex and two children (the kids I have no issue with, and the husband also no issue… so maybe you get where I’m going here). I don’t want the kids to ever read or hear me saying something negative about their mother (no matter the problems). So that’s the only thing my mouth stays shut about. My goal race this year is the Chicago Marathon. I’ve not run it before. I’ve done the RnR half in Chicago and as I lived a bit more than half of my American life there I am super stoked to have the chance to do the marathon there. My husband ran it in 2017 and I supported in various places around the course (my dad and stepmom came too and they were so excited to see Ron running – they were giddy like two little kids!). In Liverpool (may) i’ll be volunteering since surgery in 3 weeks will have me on the sidelines for a little while! volunteering is so rewarding through – it’s great you’ll be doing that soon as well! My original plan for if I ever ran a marathon was for it to be far away so I wouldn’t have the local pressure. Ultimately I couldn’t resist the call of the one I literally live on (well, one building between me and the corner – but close enough). I’m open here, but I’m also not sure anyone I know IRL, besides those who I’ve linked on occasion or those in the Wrap who I’ve met, knows the blog even though I’ve had the domain forever. For a while I filtered my FB posts on running, but my Instagram has gone from museum’gram to runnergram. It’s not usually explicit about training though. I hope your foot feels strong enough to volunteer. So glad you were able to move the su rgery up so it doesn’t impact Chicago. I’ve really come to love the volunteering, somewhat surprising to me as I don’t tend to be an active volunteer across the board. I do get what you are saying. I used to be pretty private about my blog to my IRL people but now I just don’t care if it’s known (my cousin actually once shared some stuff to my mother, whom I wasn’t speaking to at the time and that really kind of pissed me off). There’s nothing there that can hurt anyone (including myself) and if I’m not sure I don’t use anyone’s name. I also tend to not be negative (anymore) about any work situation or talk much about what I do (except occasionally massage but even that is on hold at the moment) – even though what I do is not rocket science nor is it secret. I do talk about Ron and he’s ok with that 🙂 Good thing too haha! I hope I can volunteer too. I don’t mind doing it at all but I’m also not so active across the board. Was thinking to volunteer again at Amsterrdam marathon, just not sure we’ll be home in time (also in October). Agree, such a fun one. I had bought a couple as gifts and then just had to buy one for myself. Hope your ankle is starting to feel better! I definitely tell my friends about upcoming races, but then, I’ve been running for sooo many years! I can’t wait to follow along on this exciting journey of yours! I’m SO EXCITED for you as I know you will love doing your home mara. Even though my home mara was pretty horrible, I still loved it. And you know I’m here for you every step of the way. So my goal races are the Liverpool rock’n’roll marathon in May which is really a training run for my 31 mile ultra in July. Then that will be me and racing for the rest of the year, I think. 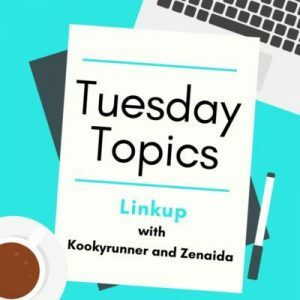 It’s funny – today is two years to the day (date might be tomorrow as it’s not showing in FB memories) since I did my first 5K, you linked me to Runners’ Bookshelf and we found a whole new-to-us thing to chat about. Can’t wait to share this journey across ~3K miles. The NYC half is so close! I’ll be there to cheer on my husband, but I still don’t know where I’m going to be – in Central Park? It would be great if we could meet somehow! You’ve got great goals for the month! I’m looking forward to finally getting to a 3 run a week schedule.